We have been hunting a long time and are experienced. Most of our bait sights are on paper company land, and we have some private land available at most times. 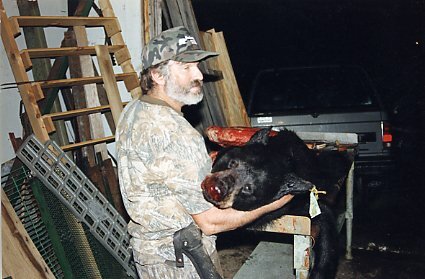 We hunt from stands and the bear are close most of the time. A good shot is a necessary thing with a bear because they are a tough animal. No matter what your choice of weapon - bow, rifle, shotgun, or muzzleloader - the main thing is a good shot. Normally we hunt from 2:00 pm in the afternoon until the last legal hunting minutes. 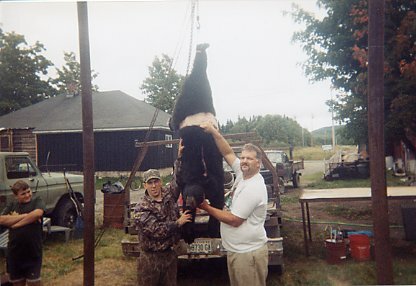 Maine has an abundant black bear population. I do not deal in ratios, I deal in results. We do not shoot cubs or promote shooting a sow with cubs. We always get a few big ones (over 300 lbs.) every year. We do whatever it takes to get you a shot.